The C&D UPS12-400MR is a part of the candd High Rate Max Series, which provides constant backup power to a UPS system. These quality designs use high energy density to assure there are no power interruptions. These type of batteries are suggested for use in data centers, network operations centers, internet hosting services, semiconductors, control facilities, and the financial market. The C&D High Rate Max Batteries are known for their long life and were specifically designed to provide customers with maximum life while still complying with industry standards. C&D batteries use state-of-the-art computer modeling and high quality materials for each and every battery, which is run through their automated manufacturing techniques. With extensive testing and years of service, C&D batteries are one of the best solutions for industrial UPS systems. Due to their patented Long Life Alloy, C&D UPS12-400MR have the lowest amount of calcium in the industry. This allows the C&D UPS12-400MR to minimize grid growth and reduces gassing, which extends the life of the battery and reduces the need for maintenance. In addition, the C&D UPS12-400MR has a flame retardant case made of polypropylene and uses a one-way pressure-relief vent to reduce the chance of overheating and keep the battery working at max efficiency. This case is thermally welded to eliminate the chance of leakage. The C&D UPS12-400MR is a valve-regulated type, often known as sealed of maintenance-free. This design sets the acid electrolyte in either a gel or a fiberglass mat. This design allows the battery to run from any position, without the need of water addition. Due to its safety features, the C&D UPS12-400MR is able to work near sensitive equipment without fear of overheating or other damage. The C&D UPS12-400MR battery is a UL-recognized component and is not restricted for air, surface, or water transport. The C&D Dynasty UPS12-400MR is a 12 volt, 102AH 400 watt lead-acid battery and can replace the UPS12-370FR and the MR12-400. Contact American Technical Support if you have more questions about this battery or the rest of our inventory. 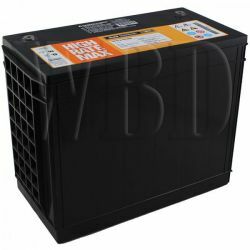 C&D Dynasty UPS12-400MR 12volt, 102AH 400 watt sealed lead acid battery, Flame Retardant. C&D designated replacement for UPS12-370FR and MR12-400. Inserted terminal design works with most flag terminal connectors without modification, flame retardant"